Model LCM-3 is the world’s first unit to measure slight amount of impurities in TFT-LCD panels nondestructively. Materials used for TFT LCDs are usually tested on a test panel with no TFT devices since it is difficult to make measurement on the liquid crystal layer of TFT-LCD panel of actual products. 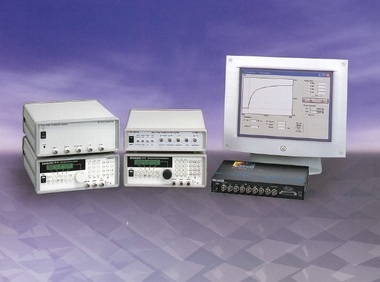 Model LCM-3 developed by our company can test a TFT-LCD panel by applying multiple voltages to the panel and measuring a micro current in the liquid crystal layer in order to determine whether display failure such as burning or flickering of the panel is caused by impurities. Since not only impurities generated from TFT-LCD panel’s component materials but also those mixed in the production process can be detected, LCM-3 can also be used for the improvement of the production process. – Measurement of ion density in actual TFT-LCD panels is realized. – Evaluation can be made for micro displays, mobile size displays, portable PC displays, and TV displays.